For some time—quite a long time, it feels like—I've been following with interest the introduction of the Sigma 30mm ƒ/1.4, a prime (single-focal-length) lens made specifically for APS-C sensor digital SLRs. After a particularly long interlude between announcement and availability, the lens finally began shipping at the beginning of August last summer. Unfortunately I can't review it, since it's only available in C. and N. mounts (in addition to Sigma's, of course), but at least there is a limited amount of information filtering through the web. There are only three reports so far at Photography Review, though they're all positive, and Pbase has a lot of samples. You can't tell much from online samples, especially small ones, but fortunately the one thing you can get a handle on, sort of, is one of the most individualized characteristics of a lens—its bokeh or out-of-focus rendering. From what I can tell, the bokeh looks much like that of the better 50/1.4s for 24x36, i.e., quite good, although it may get a little stressed when the subject is just too close (for instance in this set of test shots by vibrio). Crucially, its o-o-f rendering at ƒ1.4 seems excellent. Curiously, Sigma hasn't opted to take advantage of the smaller image circle to make the lens small and light—at 15.2 oz., it's about half again the weight of an average 50/1.4. 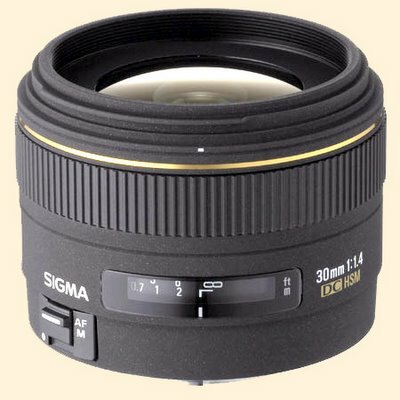 But Sigma does say it's carried out one of the most important modifications for a digital lens, and coated the lens from the back just as well as it's coated from the front. Many hobbyists don't know this (and many more don't care), but lensmakers seldom multi-coat a "multi-coated" lens on every surface of every element; rather, they do what they have to to get flare down to an acceptable level, and if that allows for single-coating some surfaces or even for leaving some surfaces uncoated altogether, so much the better for the bottom line. Rumor has it that it was Tamron that figured out that with digital sensors, there is much more reflection back off the sensor to the rear of the lens than there is with film, and that lens performance is enhanced significantly by coating the lens against light entering from the back. It's one of the prime predictors of good DSLR-lens performance, and one of the reasons why many lenses built for 35mm film cameras aren't ideal for digital. All but the best ones, that is. There's another samples gallery, by Fotoworkz, here. Note that if you click on the samples it will pull them up at full size. As for flare resistance, sharpness, consistency, and the most important specification of all—sales numbers—don't ask me. Featured Comment: carpeicthus said, "I adore this lens. I have 269 real-world samples here."